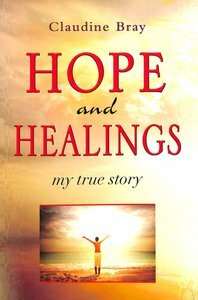 :Hope and Healings-My True Story is an encouraging and faith-filled story about how one woman faced satan's attacks on her physical body time and time again-and she always emerged victorious because of her hope in God's healing touch. You too will be encouraged no matter what problems you may be facing-illness, financial difficulties, relationship issues-with God all wounds can be healed! You will learn how to become a victor-not a victim. Miracles happen every day-and in God's own time, you can expect a miracle too. When you believe that your bat-tle has already been won by Almighty God, all your hard times will soon be over, replaced with a great future. May the God of hope fill you with all joy and peace as you trust in him, so that you may overflow with hope by the power of the Holy Spirit (Romans 15:13). About "Hope and Healings: My True Story"
Claudine Bray was born in Honfleur, Normandy. To be-come an English teacher in France, she often visited England where she met an Australian. They married in 1975 and settled in Perth, Australia. They have two lovely daughters, now married. Claudine teaches languages and enjoys attending church, healing meetings, and overseas conferences as well as bike riding and assisting tourists at the Information Centre in Fremantle.